POSTCARD#313: Bangkok: My first visit to the eye hospital, unwilling to go, but blurred vision in the both eyes, and still I’m thinking it’s nothing, disregarding the fact that I’m finding it difficult to read, identify coins, and other necessary actions. Making excuses for a long time, and going on like this until I’m stumbling into things too many times; only then am I persuaded I need to go. Even so, still insisting no, I don’t need anyone to come with me. Thank you, I can manage by myself and next thing, I’m squeezing through the crowds at the Skytrain (overhead railway) entrance to get a one-day ticket (because it’s easier than putting the right coins in the slot). Some regret then, that I’d refused the kind offer of someone to come with me, but another part of me insisting I can manage, I’ve done this so many times what could go wrong? Same old situation, I am a foreigner living in someone else’s country, not possible to ask anyone for help, too complicated to explain – therefore there’s that familiar alertness, awake and mindful. Getting off the train is a challenge, it’s a place I’ve not been to before, and I can read Thai but can’t seem to find the correct exit (the signs are unclear?) So I choose to go with the North/South orientation of the map, knowing that if I face the way the train is travelling as I get off, in this case North, and as I go down the staircases and escalators to street level, I’m always orientated in that same Northerly direction and notice which way the traffic is going so it’ll be easier for the taxi driver. 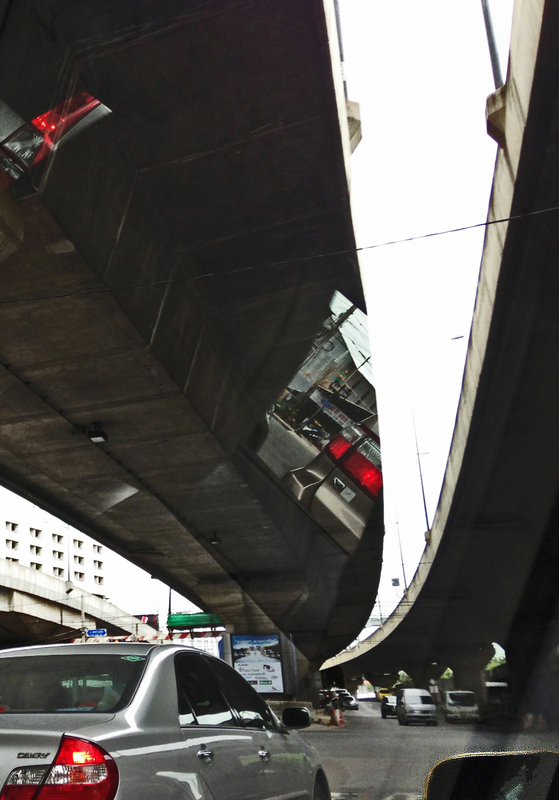 All this because doing a U-turn can be a lengthy process here; somebody said the whole of Bangkok is one large, U-turn…. 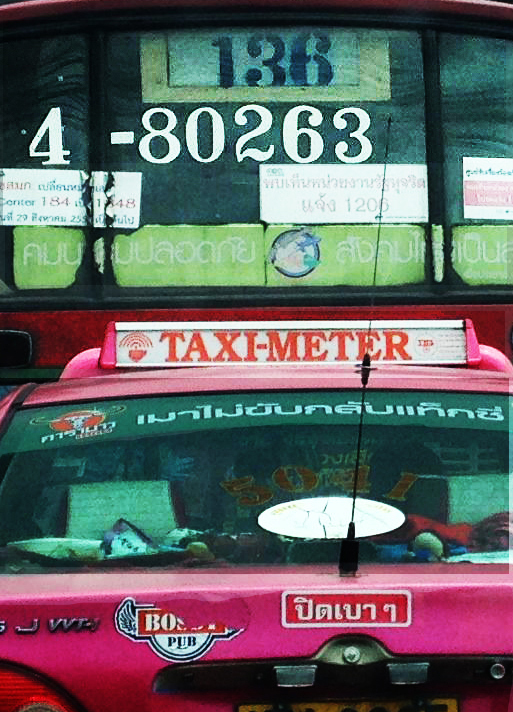 A pink and white cab is waiting and I tell the driver where I’d like to go – will he take me? He thinks for a bit (doing U-turns in his head), yes, ok. So we’re off. At the hospital, it’s a long session. I’m lying down and they put some drops in my eyes to enlarge the pupils so their equipment can see inside the eye (this is just so freaky). The doctor asks me if there’s anybody to take me home because the drops in the eyes will make things a bit indistinct for a few hours. I’m in denial, thinking, I’ve been living in an indistinct world for a long time and have managed okay. But when I step outside, it’s raining and the world is a blur, a smear, a sea of colour, yellow, green and pink taxis, red tail lights of vehicles in vivid splashes. No form or definition anywhere, I’ve lost my North/South orientation, having come into the hospital by a different door. What to do? A motorbike taxi comes along and I tell him where to go and get on – let him to sort it out. 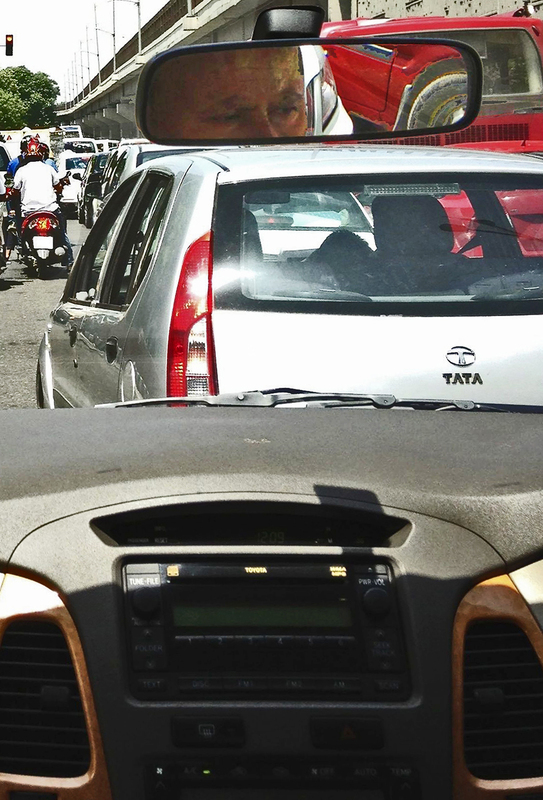 We get up to a surprising speed on what I believe to be the wrong side of the road, dodging oncoming traffic, weaving in and out of the other lane, wherever there’s a space. They take the eye shield off next morning. I get dressed, go downstairs to the outpatients department and through to the exit. The décor in the waiting area is in shades of lime green and ice blue, colours are amazing. Unexpected. There’s a completely clear perception of distance for the first time in many years. Fascinating. I’m distracted by colour and movement at the edge of vision, face turns in that direction, curiosity – an involuntary response. Head spinning like a child or a small animal, noticing all kinds of things. Sense organs filter incoming information. In my case, visual data enters through implanted intraocular lenses (IOLs). I see the world and assume it exists exactly as I perceive it, but I know the lens implant has, to some extent, created my version of the world; perception is subjective, reality is a construct in the mind. I can see a wide range of colours where insects see ultraviolet, reptiles see infrared, and cats and dogs see the world in only two colours. Viewed in this way, the world is suddenly endowed with great mystery; ask the question: ‘what is reality?’ and it takes you to a different place entirely. POSTCARD♯09: Delhi: The flight from Bangkok arrives at Delhi mid-morning. I’m identified, processed and out in the crowd. Shym is waiting with the car, bags inside and we’re in the huddle of traffic. Not so much give-and-take, more like push-and-shove. They’re opportunists; mindfulness is a necessity. Same old thing. Looking around, what’s different? An unusual brightness, it’s the lens implant, the operation on the left eye in Bangkok. I have to put up with this one-eyed vision only for a little longer. Next week I go back for the second op. All these flights are possible, fortunately, due to some free airmiles we have to use before the end of the year. And coming back to Delhi means I’m noticing the difference in vision here. So nice, much clearer now through the left eye, it looks… clean? What I thought was urban pollution, may have been obscured vision – or what I’m seeing now is an enhancement, a brightened-up version of everything. Close the left eye and look through the right; that’s how Delhi used to be, a dull, indistinct, old, yellowed photograph. Close the right eye and look through the left again and it’s like the Nat Geo channel, as clear as the iPhone5 retina display, 326 pixels per inch; using the techno-device metaphor to describe reality. The world is a kind of analogy, a figure of speech, the conceptual metaphor. In my case the lens in one eye is plastic, not God-given – the same as having an artifical leg or a dental crown. Nothing special about it except that you walk around with an artificial leg, you chew with a dental crown but I’m seeing the world through this artificial lens. There’s a difference. The world is coming in, ‘seen’ through the plastic. The lens is a functioning part of the cognitive process. The assumption is that everything coming through the senses is real; sight, sound, smell, taste, touch, cognition – and it’s all coming to (((me))). That’s reality, that’s the point of the exercise. I like it, I want it, I want more of it, and so closing the door on other ways of seeing things. Saying this is how it is, means I get all the joy and pain, the good with the bad, love and hate, heaven and hell – thus I have to spend a major part of my life (maybe many lifetimes) trying to control this craving and desire [tanha] that I accidentally created, thinking I was doing the right thing. What to do? How to not be a slave to it? Just the intention to be mindful is enough, the tipping point, sufficient to disengage from the automatic reaction. Not caught up in the experience of it, far enough back, one step removed, just knowing it’s there; that’s all. Knowing it takes the place of not knowing it. Step by step, learning how to do it…. 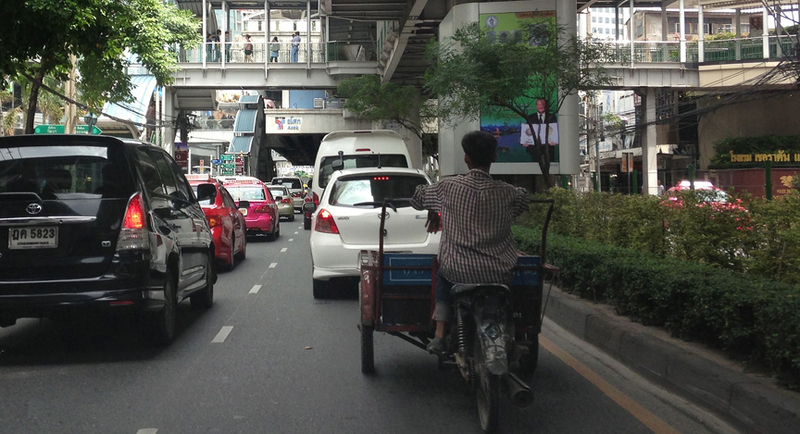 Bangkok: Near Asoke, downtown, on my way to the eye hospital for an appointment at 3.20pm. I have a lens implant in the left eye and the surgeon is going to take out the stitch that’s been in the eye for 2 weeks. Today’s the day… dum-dee-dum, sing a song and forget about that (resistance to the thought of needles and eyes). A space in the mind opens up for a moment, and I take refuge in there, calm abiding; if a feeling is not present, I am not aware of it. Thoughts return, the fragility of things; eyeballs and eardrums, taste buds and nerve endings, vulnerability, perishability, finely tuned, limited lifespan. 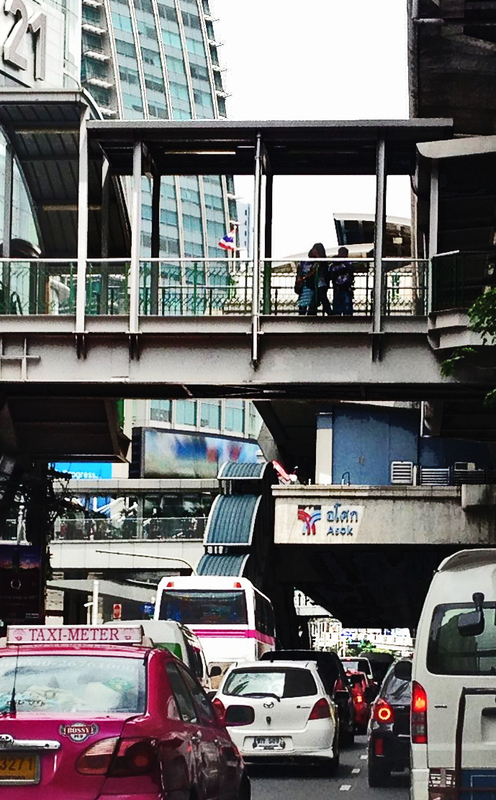 Get involved with my surroundings; crowds of browsers in the Asoke shopping area, a wealth of attractive objects. There was something I was supposed to get but I’ve forgotten what it was; new input replaces existing memory. How much time before the eye appointment? The memory comes back again… somewhere else, the needle-and-eye situation is happening to some other person, not me. Abide in the space of no-thought, remembering about the thing I’m looking for that I’d forgotten (I’ll remember what it was later), and just contemplating the empty space where it used to be. It’s not just forgotten, it’s not there at all; replaced with a kind of consciousness I can’t identify, an awareness of the seeking? Seeking leads to the sense that something is missing, the suffering caused by wandering in a created world of being lost. The mind that seeks is restless, searching for things endlessly but never finds what it’s looking for. Always, always reaching out for something beyond the here-and-now: the sense there’s got to be something that’s better than this. There’s a place somewhere else where I’ll find the thing I’m looking for… but how will I recognize it if I don’t know what it is… ho hum, depending on the belief there’ll just be some kind of extraordinary familiarity and recognition? Somebody wise said: ‘What we are looking for is that which is looking…’ The mind that sees this relentless searching sees that other mind that seeks this; two minds. What am I seeing? Mindfulness and the curious situation of just seeing the seeking – and there’s no object. Seeking non-objects means seeking the seeking itself; seeing ‘the seeing’, the situation before the question arose, the motionless space in which everything exists; context and content. Walking through the doors of the eye hospital as if in a dream, wait in the waiting area for my number to be called, then into a cubicle. Lie down on the bed, stare at the ceiling and the nurse bathes the eye with antiseptic eye-drops every 5 mins for 30 mins, then into the surgeon’s room. Lean back and more eye drops, anesthetic this time. I sit facing the opthamologist, a lady, place your chin here, she says and there’s a kind of binocular device for seeing into my eyes in an adjustable stainless steel structure with chin-rest and my head is held in the steel frame. I tell her I’m nervous, Painless, she says, it’s painless… and smiles at me reassuringly. I hear a sound like plucking violin strings, pizzicato, in the upper registers, ‘ting, ting’. Am I really hearing this small musical sound? I catch a glimpse of the surgeon’s tiny cutting tool as it releases the cords of the held stitch. She says it’s over… can’t believe it. Sometime later that day, I remember what it was I’d forgotten in the Asoke shopping area*. I’ll have to leave that until I come back for the next operation on September 20th. This post contains references to the Betty Edwards text: ‘The New Drawing on the Right Side of the Brain‘ and the text ‘The Path of No-path: Śaṅkara and Dogen on the Paradox of Practice’ by David Loy.